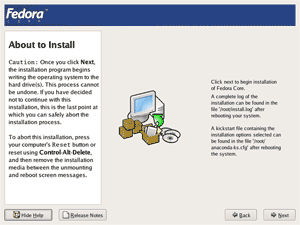 Running Anaconda the Graphical Fedora Core 4 System Installer - Installation Configuration Process. The article below show step by step installation configuration process of Fedora Core 4 using anaconda Linux Fedora Core system installer. 1. After checking all the installation CD-ROMs, on the "Media Check" screen, press [Continue] button to start 'Anaconda' the Fedora Core 4 system installer. This is the starting point on install Fedora Core 4 operating system on your computer. 2. Anaconda is the graphical mode / GUI installer for Fedora Core 4. Anaconda begin with a Welcome screen. The Welcome screen does not prompt user for any input. It is recommended that you read over the help text on left panel for additional information and function for the current installation screen. Click [Next] button to proceed. During this installation, you can use your mouse or keyboard to navigate through the various screens. The Tab key allows you to move around the screen, the Up and Down arrow keys to scroll through list, + and - keys expands and collapse list, while Space and Enter selects or removes from selection a highlighted item. you can also use the Alt-X key command combination as a way of clicking on buttons or making other screen selection, where X is replaced with any underline letter appearing within that screen. Use the Next and Back buttons to progress through these screens. Click Next to save the information and proceed to the next screen; click Back to move to the previous screen. To minimize this help screen, click on the Hide Help button. These release notes provide an overview of futures that may not have been available for documentation. To view the release notes, click the Release Notes button and a new windows appears. Click Close to close the release notes and return to the installation program. You can cancel this installation any time before the About to Install screen. When you click Next on About to Install, package installation begins and data is written to your hard drive. To cancel before this screen, you can safely reboot your system (using the reset button, or Ctrl-Alt-Del). 3. "Language Selection", select language that you understand and want to use during this Fedora Core 4 operating system installation process. In this project we use English language to be used along the installation process. What language would you like to use during the installation process? Scroll and click on the language to highlight the language that you want to use during the installation, then click the [Next] button to proceed with the installation process. Choose the language you would like to use during this installation. 4. Find out the layout of your keyboard that you used on your system, then select the appropriate keyboard that match the keyboard use on your system. 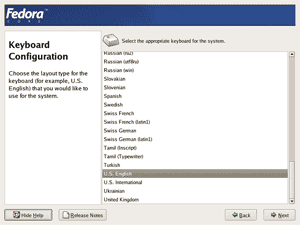 In this project we used the U.S. English keyboard ( U.S. English keyboard layout ). What type of keyboard that you use on your system? Scroll and click on the keyboard type to highlight the keyboard layout type that you want to use on your system. 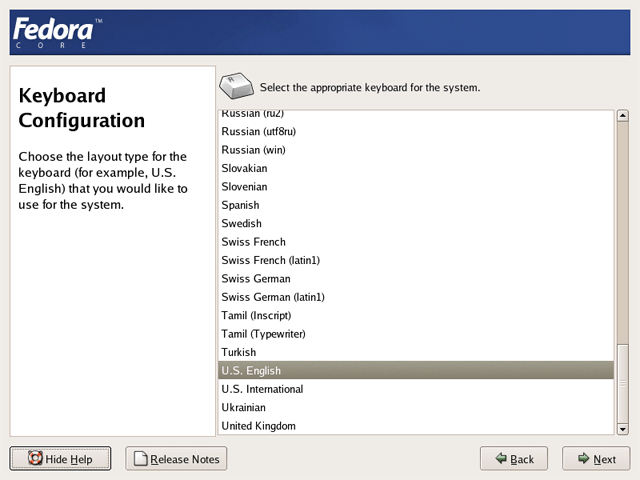 Choose the layout type for the keyboard (for example, U.S. English) that you would like to use for the system. 5. The installation screen then prompt four "Installation Type" that you can choose from. Choose the installation type that best meet your need. In this project we choose Custom type to gain complete control over the the installation process. Personal Desktop - Perfect for personal computers or laptops, select this installation type to install a graphical desktop environment and create a system ideal for home or desktop use. Workstation - This option installs a graphical desktop environment with tools for software development and system administration. Server - Select this installation type if you would like to set up file sharing, print sharing, and Web services. Additional services can also be enabled, and you can choose whether or not to install a graphical environment. 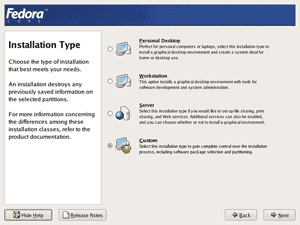 Custom - Select this installation type to gain complete control over the installation process, including software package selection and partitioning. Click on the "Custom" installation type radio button then click on the [Next] button to proceed with the installation process. Choose the type of installation that best meet s your needs. An installation destroys any previously saved information on the selected partitions. For more information concerning the differences among these installation classes, refer to the product documentation. 6. To partition the hard disk, you can choose to use Automatically partition or Manually partitioning with Disk Druid in the disk partitioning setup. In this project, we chose Automatically partition. Automatic Partitioning sets partitions based on the selected installation type. You also can customize the partitions once they have been created. The manual disk partitioning tool, Disk Druid allows you to create partitions in an interactive environment. You can set the file system types, mount points, partition sizes, and more. Choose Automatically partition or Manually partitioning with Disk Druid by clicking the radio button. Click [ Next ] button to proceed. One of the largest obstacles for a new user during a Linux installation is partitioning. This process is made easier by providing automatic partition. By selecting automatic partitioning, you do not have to use partitioning tools to assign mount points, create partitions, or allocate space for your installation. To partition manually, choose the Disk Druid partitioning tool. Use the Back button to choose a different installation, or choose Next if you want to proceed with this installation. 7. On the Automatic Partitioning, we choose the < Keep all partitions and use existing free space > to make sure that only free space on the hard disk is used for Fedora Core 4 installation. Click Next button to proceed. Before automatic partition can be set up by the installation program, you must choose how to use the space on your hard drives. Choose the best method to use your hard disk space to make room for Linux partition by click on the radio button. If you have more than one hard disk, select the disk that you to put your Linux partition by clicking on the checkbox. Click the checkbox to check the partition created by the automatic partition scheme and you can modify this created partition if needed. Automatic partitioning allows you to have some control concerning what data is remove (if any) from your system. To remove only Linux partitions (partitions created from previous Linux installation), select Remove all Linux partitions on this system. To remove all partitions on your hard drive(s) (this includes partitions created by other operating systems such as Windows 95/98/NT/2000), select Remove all partitions on this system. To retain your current data and partitions, assuming you have enough free space available on your hard drive(s), select Keep all partitions and use existing free space. Using your mouse, choose the hard drive(s) you want to install to. If you have multiple hard drives, you can choose which hard drive(s) should contain this installation. Unselected hard drives, and any data on them, are not touched. You can review and make any necessary changes to the partitions created by automatic partitioning by selecting the Review option. 8. The Disk setup using the Disk druid appear only if you click 'Review (and modify if needed) the partition created' checkbox on the above procedure. Disk Druid display the graphical representative layout of your hard disk partition. Disk druid also allow you to edit the partition scheme that that already created. Choose where you would like Fedora Core to be installed. If you do not know how to partition your system or if you need help with using the manual partitioning tools, refer to the product documentation. If you used automatic partitioning, you can either accept the current partition settings (click Next), or modify the setup using the manual partitioning tool. If you are manually partitioning your system, you can see your current hard drive(s) and partition displayed below. Use the partitioning tool to add, edit, or delete partitions for your system. Note, you must create a root (/) partition before you can proceed with this installation. If you do not create a root partition, the installation program does not know where to install Fedora Core. The graphical representation of your hard drive(s) allows you to see how much space has been dedicated to the various partitions created. Below the graphical representation, you can see a file system hierarchy showing your existing partitions. Using your mouse, click once to highlight a partition or double click the partition to edit it. The center row of buttons controls the partitioning tool's actions. You can add, edit, and delete partitions here. In addition, there are buttons you can use to accept the changes you have made, or to reset and exit the partitioning tool. New: Use this button to create a new partition. A dialog box appears containing fields that must be filled in (such as mount point, file system type, drive that the partition should exist on, size, and so on). Edit: Use this button to change the mount point of a currently selected partition. You can also manually create a partition by editing free space (if available). Editing free space in this sense is similar to using parted in that you can choose where the partition begins and ends within that free space. Delete: Use this button to delete a partition. Reset: Use this button to cancel your changes. RAID: Use the RAID button ONLY if you have experience using RAID. To make a RAID device, you must first create software RAID partitions. Once you have created two or more software RAID partitions select RAID to join the software RAID partitions into a RAID device. LVM: Use the LVM button ONLY if you have experience using LVM. To create an LVM logical volume, you must first create partitions of type physical volume (LVM). 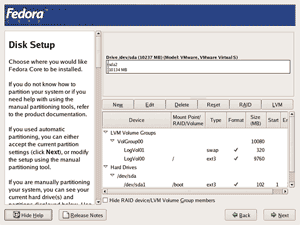 Once you have created one or more physical volume (LVM) partitions, select LVM to create an LVM logical volume. 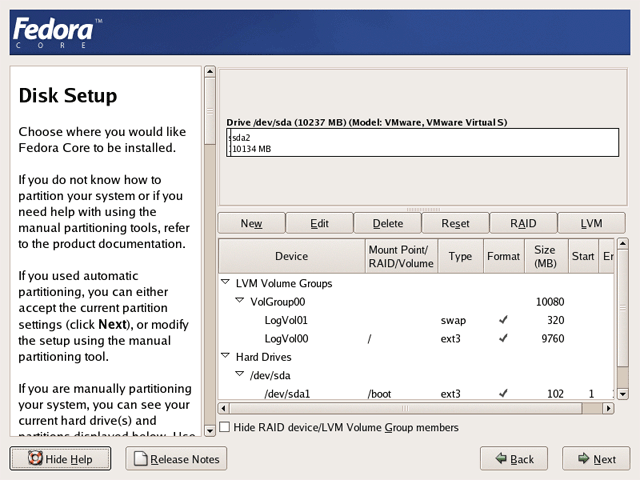 Select this option if you do not want to view any RAID device or LVM Volume Group members that have been created. 9. 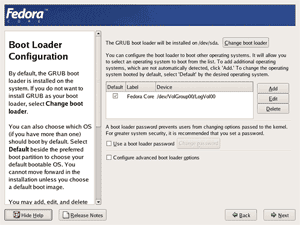 Boot Loader Configuration, by default Grub is the boot loader program used by Fedora Core to boot your operating system. The Grub boot loader will be installed on your MBR (master boot record), to change or if you do not want to install Grub click [ Change boot loader ] button. If you have more than one operating system install on your system, you can configure to boot which operating system from the list menu to be your default operating system for the system. If you want to have a password for your boot loader click the checkbox on 'Use a boot loader password'. By default, the GRUB boot loader is installed on the system. 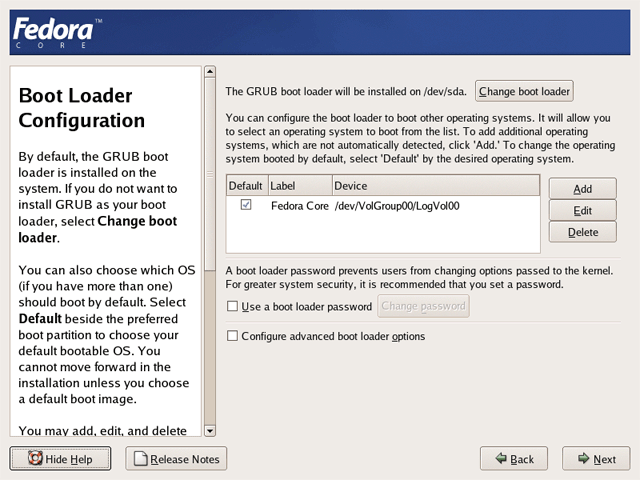 If you do not want to install GRUB as your boot loader, select Change boot loader. You can also choose which OS (if you have more than one) should boot by default. Select Default beside the preferred boot partition to choose your default bootable OS. You cannot move forward in the installation unless you choose a default boot image. You may add, edit, and delete the boot loader entries by selecting a partition with your mouse and then clicking on the appropriate button. To enhance your system security, select Use a Boot Loader Password. Once selected, enter a password and then confirm it. If you want to configure where the boot loader is installed or if you want to add options to the boot command, select Configure advance boot loader options. 10. 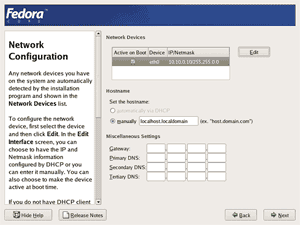 The network configuration can be configured either automatically using DHCP (Dynamic Host Configuration Protocol) or you can manually configure the network device during the installation process. Highlight on the network interface card eth0 and then click the [Edit] button. to enter your static IP addresses for the selected interface. 11. 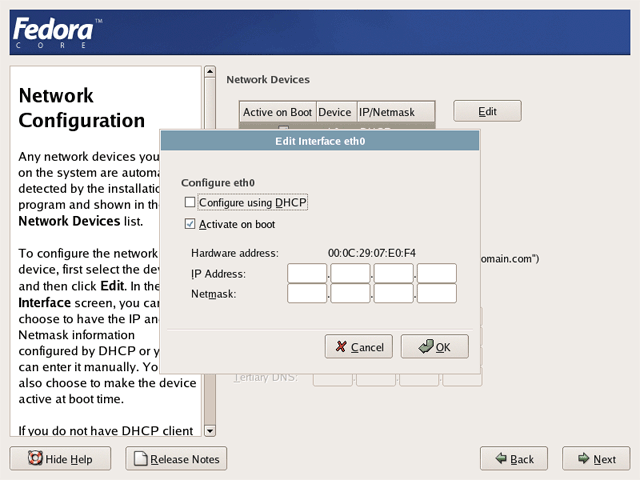 Leave the "Configure using DHCP" checkbox tick, if your network using DHCP for network configuration. 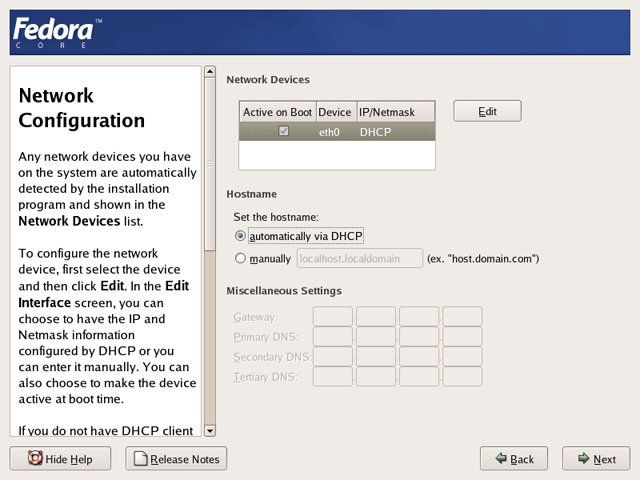 If you plan to manually configure the network device using static IP address, click on the "Configure using DHCP" check box to un tick the check box, leave the "Active on boot" tick to make sure the interface eth0 active after boot-up. Click [Ok] button after you done enter the IP address and the netmask to continue. On the Miscellaneous Settings put the Gateway, Primary DNS, Secondary DNS and Tertiary DNS configuration manually. Note: for the IP address, Net mask, Hostname, Domain, Gateway, Primary DNS, Secondary DNS and Tertiary DNS used on your network system, consult your system administrator. 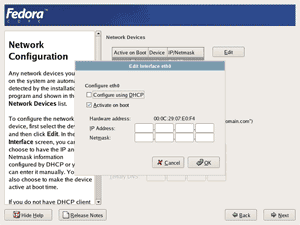 Any network devices you have on the system are automatically detected by the installation program and shown in the Network Devices list. 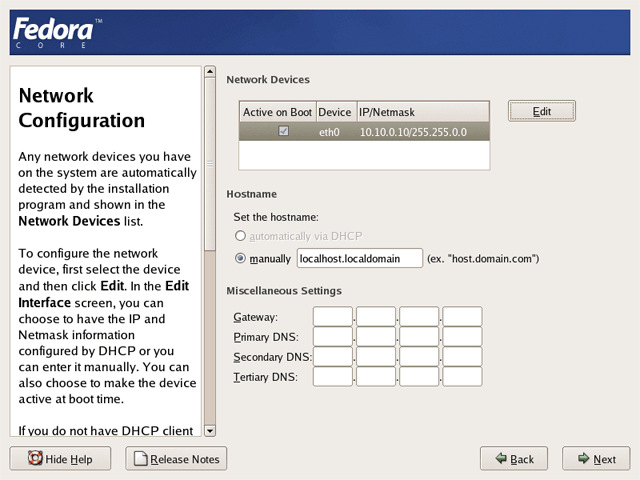 To configure the network device, first select the device and then click Edit. In the Edit Interface screen, you can choose to make the device active at boot time. If you do not have DHCP client access or are unsure as to what this information is, please contact your Network Administrator. 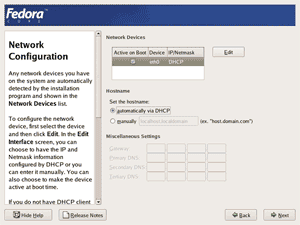 If your system is part of a larger network where hostnames are assign by DHCP, select automatically via DHCP. Otherwise, select manually and enter an FQHN-based hostname for your system (such as name.example.com). If you do not, your system will be known as "localhost". Finally, if you entered the IP and Netmask information manually, you may also enter the Gateway address and the Primary, Secondary, and Tertiary DNS address. 13. A Firewall can help prevent unauthorized access to your computer from the outside world. If you enables the firewall setting the Fedora Core, the firewall will allows connections from your system to others, but block incoming connections from others, you might need to change these setting if you need to allow access to specific network services to your system. To allow access to specific services on your computer from other computer through your firewall you need to tick the checkbox on the service that you wish to allow access to your system. Security Enhanced Linux (SELinux) provides extra security against unauthorized access by enforcing the security policies throughout the operating system. You can choose to set Active, Warn or Disable the SELinux mode by click the dropdown button. A firewall sits between your computer and the network, and determines which resources on your computer remote users on the network are able to access. A properly configured firewall can greatly increase the out-of-the-box security of your system. Choose the appropriate security level for your system. No Firewall -- No Firewall provides complete access to your system and does no security checking. Security checking is the disabling of access to certain certain services. This should only be selected if you are running on a trusted network (not the Internet) or plan to do more firewall configuration later. Enable Firewall -- If you choose Enable Firewall, connections are not accepted by your system (other than the default settings) that are not explicitly define by you. By default, only connections in response to outbound requests, such as DNS replies or DHCP requests, are allowed. If access to services running on this machine is needed, you can choose to allow specific services through the firewall. If you are connecting your system to the internet, but do not plan to run a server, this is the safest choice. Next, select which services, if any, should be allowed to pass through the firewall. Enabling this options allow the specified services to pass through the firewall. Note, these services may not be installed on the system by default. Make sure you choose to enable any options that you may need. Remote Login (SSH) -- Secure Shell (SSH) is a suite of tools for logging in to and executing commands on a remote machine. If you plan to use SSH tools to access your machine through a firewal, enable this option. You need to have openssh-server package installed in order to access your machine remotely, using SSH tools. Web Server (HTTP, HTTPS) -- The Http and HTTPS protocols are used by Apache (and other web servers) to serve webpages. If you plan on making your Web server publicly available, enable this option. This option is not required for viewing pages locally or for developing webpages. You must install the httpd package if you want to serve webpages. File Transfer (FTP) -- The FTP protocol is used to transfer files between machines on a network. If you plan on making your FTP server publicly available, enable this option. You must install the vsftpd package in order to publicly serve files. Mail Server (SMTP) -- If you want to allow incoming mail delivery through your firewall, so that remote hosts can connect directly to your machine to deliver mail, enable this option. You do not need to enable this if you collect your mail from your Internet Service Provider's server using POP3 or IMAP, or if you use a tool such as fetchmail. Note that an improperly configured SMTP server can allow remote machine to use your server to send spam. Additionally, you can now setup SELinux (Security Enhanced Linux) during your installation. The SELinux implementation in Fedora Core is designed to improve the security of various server daemons while minimizing the impact on the day-to-day operations of your system. Disable -- Select Disable if you do not want SELinux security controls enable on this system. The Disable setting turns enforcing off and does not set up the machine for the use of security policy. Warn - Select Warn to be notified of any denials. The Warn state assigns labels to data and programs, and logs them, but does not enforce any policies. The Warn state is a good starting place for users who eventually want a fully active SELinux policy, but who first want to see what effects the policy would have on their general system operation. Note that users selecting the Warn state may notice some false positive and negative notifications. Active -- Select Active if you want SELinux to act in a fully active state. The Active state enforces all policies, such as denying access to unauthorized users for certain files and programs, for additional system protection. Choose this state only if you are sure that your system can still properly function with SELinux fully enable. 14. The window screen prompt user to select time zone. There are two ways of selecting the time zone. 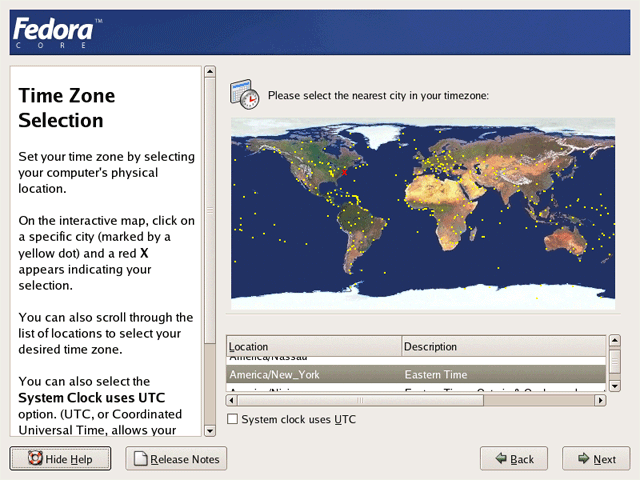 First by clicking nearest city in user time zone on the map given using the mouse cursor. Second is by browsing through locations and description located below the map. Highlight the time zone that best describe your computer physical location and click [Next] button to proceed with the instalation process. 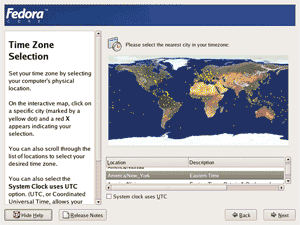 Set your time zone by selecting your computer's physical location. On the interactive map, click on a specific city (marked by a yellow dot) and a red X appears indicating your selection. You can also scroll through the list of locations to select your desired time zone. You can also select the System Clock uses UTC option. (UTC, or Coordinated Universal Time, allows your system to properly handle daylight-saving time.) Select this if your computer's hardware clock is set to your local time. 15. The window screen then prompt user to set password for root. Root user is the most powerful user or administrator in the Linux system. Set an appropriate password. Make sure that you remember the root password to prevent from any difficulties in future. 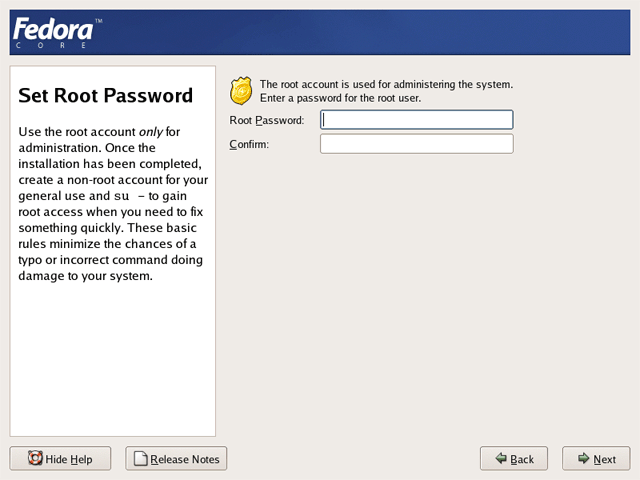 The root account is used for administering the system. 16. The window screen then prompt user to select packages to be installed on the system. Select preferred packages by clicking the check-box beside the packages. To select full content of each package, click Details. This will link to a new window. Note: this window screen appear only if you choose the "Custom installation type" on above procedure. 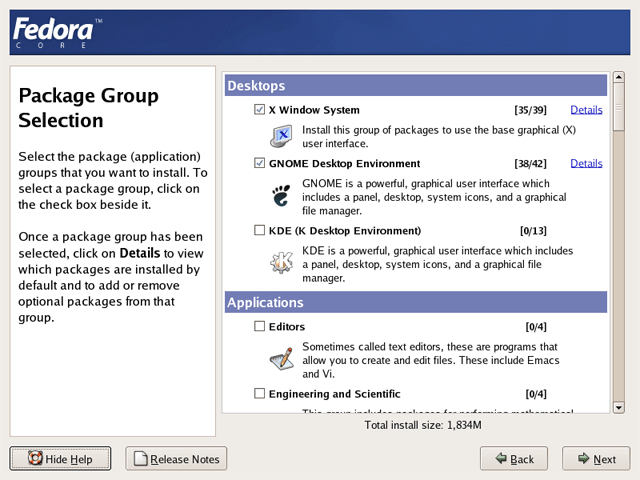 Select the package (application) groups that you want to install. To select a package group, click on the check box beside it. 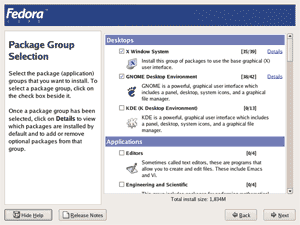 Once a package group has been selected, click on Details to view which packages are installed by default and add or remove optional packages from that group. 17. About to Install. The installation program will then display information on the installation. Click [Next] button to proceed with the installation process. 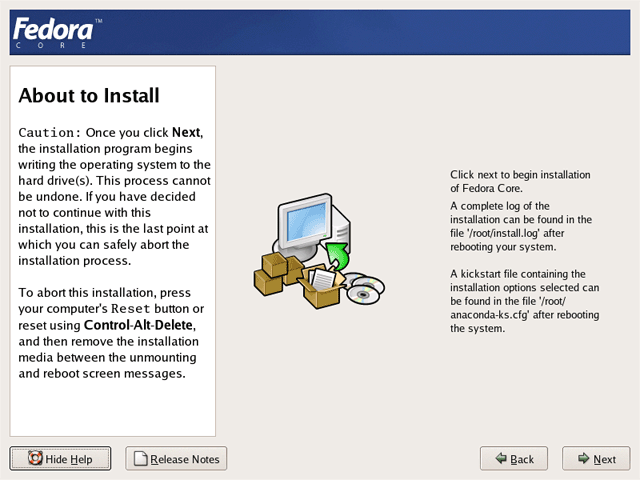 Click Next to begin installation of Fedora Core . A complete log of the installation can be found in the file '/root/install.log' after rebooting your system. A kickstart file containing the installation options selected can be found in the file '/root/anaconda-ks.cfg' after rebooting the system. 18. Make sure that you have all the installation media that needed during the installation process with you, usually you only need the Fedora Core 4 CD 1, CD 2 and CD 3, but for full packages intallation you also need Fedora Core CD 4. Note: It's recommended that you prepare all four installation CD before continue with the installation process. 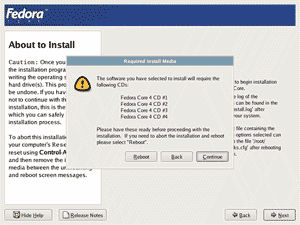 IF you have all "Fedora Core 4 installation CDs" media that is require by the installation process with you, click on the [Continue] button to begin the installation, or click on the [Reboot] button to abort/cancel the Fedora Core 4 installation process. NOTE: There is no return back after you click the 'continue' button. the installation process will start to format and partition your hard disk to prepare for installing Fedora Core 4 operating system. If you not sure or want to abort the installation this last chance to do so. Click the 'Reboot' button to restart the system and back to original state. Please have these ready before proceeding with the installation. If you need to abort the installation and reboot please select "Reboot"
Note: The installation media required for the Linux Fedora Core installation process is depending on selected 'Installation Type' and how many additional packages selected to be install to the system. Caution: Once you click Next, the installation program begins writing the operating system to the hard drive(s). This process cannot be undone. IF you have decided not to continue with this installation, this is the last point at which you can safely abort the installation process. To abort this installation, press your computer's Reset button or reset using Control-Alt-Delete, and then remove the installation media between the unmounting and reboot screen messages. 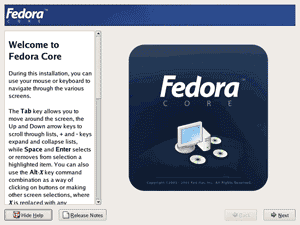 All Fedora Core 4 installation screen capture publish here are for educational purpose only. Your suggestions and comments to improve this page or may be on the Fedora Core 4 installation screencapture are welcome. 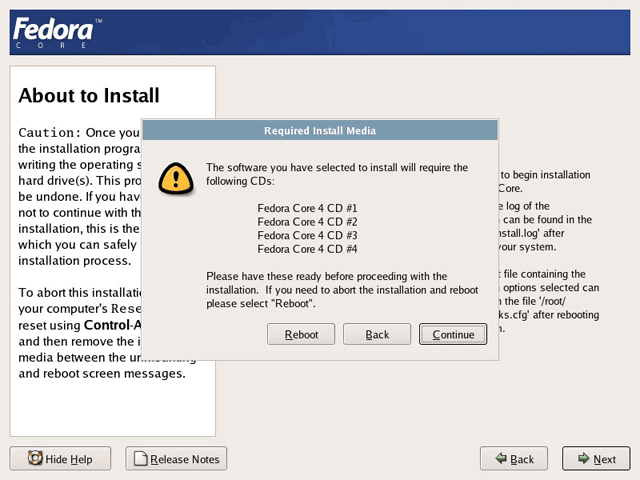 BACK: Test the Fedora Core 4 installations media using Linux Media Check. 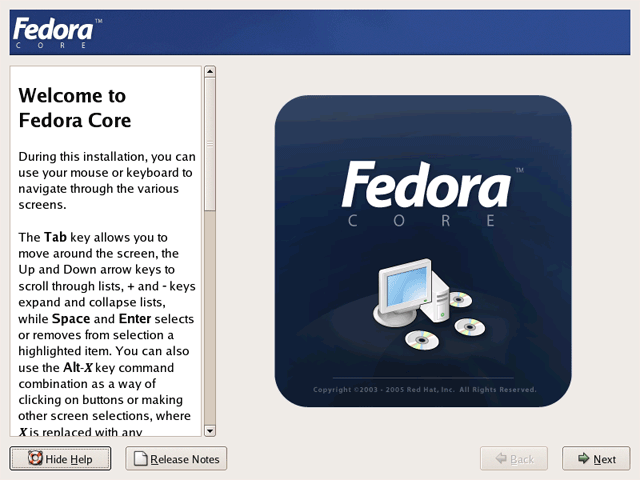 NEXT: Fedora Core 4 Installation Process Start to install Fedora Core 4 to Hard Disk. 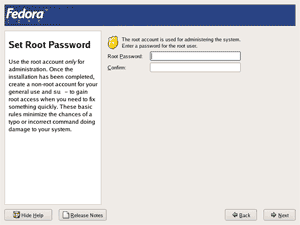 Keywords: anaconda installer, anaconda installation, anaconda linux installation, fedora core 4 installation, installation configuration, running anaconda, fedora core 4 installer, fedora system installer, anaconda screenshot, anaconda installation configuration.